Over the past several months, we've made several mentions of commercial airlines testing the iPad as a replacement for flight bags used by pilots. 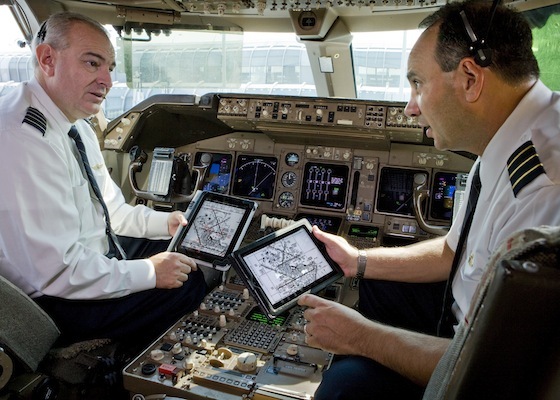 The testing programs have been looking to replace bulky and heavy flight bags full of navigational charts and other materials with iPads in order to reduce the weight of pilots' bags and save fuel on flights. United Airlines today announced that it has gone a step further, committing to a full transition to using iPads as electronic flight bags and rolling out 11,000 iPads to United and Continental pilots. Each iPad, which weighs less than 1.5 pounds, will replace approximately 38 pounds of paper operating manuals, navigation charts, reference handbooks, flight checklists, logbooks and weather information in a pilot's flight bag. A conventional flight bag full of paper materials contains an average of 12,000 sheets of paper per pilot. The green benefits of moving to EFBs are two-fold--it significantly reduces paper use and printing, and, in turn, reduces fuel consumption. The airline projects EFBs will save nearly 16 million sheets of paper a year which is equivalent to more than 1,900 trees not cut down. Saving 326,000 gallons of jet fuel a year reduces greenhouse gas emissions by 3,208 metric tons. The iPads are equipped Jeppesen Mobile FliteDeck, which is a free download from the App Store but requires a paid subscription to Jeppesen's services. The report notes that the iPads will streamline pilots' work by eliminating the need for thumbing through sheafs of paper or waiting for pages to print. The iPads will reduce clutter on cramped flight decks and offer quick and easy access to required data at all times. Gives a whole new meaning to Airplane Mode. Dumb idea. When the iPad runs out of battery and/or dies the pilots won't be able to navigate the SIDS/STARS when on departure or arrival. Um, you do realize that cockpits have electricity generated by the ENORMOUS TURBINES strapped to their backs, right? But remember, iPads are just for consuming content, not for real work! I call ********. iPads aren't saving on fuel by cutting weight. Not only that, but everyone knows that you always have to have a hard copy of whatever you are trying to use for an electronic device. So the maps are there on the plane weather an iPad is or not. Right, because 38 pounds == 1.5 pounts. And everyone knows you have to have paper, except the people running United Air (and the other airlines also pushing iPads). Of course, you know a lot more than them. Not sure why they didn't consult with you first. You've got no clue about what your talking about. The pilots replace their personal flight kits at about 40lbs each with iPads. The aircraft will still have a "backup" set of minimum pubs onboard that has always been on board, stored in the cockpit, regardless of what form of manuals the pilot carries. It is (at least at Delta) sealed in plastic to ensure its contents aren't used and misplaced. It is the so called "backup". The iPads replace the two pilot bags that you see pilots drag through airports, hanging on the back of their roll-aboard. At Delta, we stopped carrying those about a year ago, and the company provides the pilot materials at each cockpit seat in paper form, still 40 lbs each, so they reduced the waste of having 12,500 pilots carry these pubs. So at Delta, there are about 1,500 of these now, one for each of two seats across a fleet of 750 aircraft. But the weight of 80 lbs per aircraft (the pilot's company provided pubs at each seat) will be replaced with iPads. If you recall your physics, you can not lift 80 lbs of weight to 40,000 feet without expending energy (fuel). How much energy would it take if you devised a canon that could shoot 80 lbs to that altitude and across the country? To say it costs nothing to carry these pubs as compared to carrying two iPads is true ignorance. At Delta, they have numbers for how much it costs to carry an extra can of Coke on a flight, and savings gained through lighter service trays and glassware. We fly nearly 100,000 flights per year, it all adds up very quickly. Stick to what you know. The airline industry and how it operates is clearly not on that "list". I'd better not see one of those in use during take off or landing. There are so many stupid posts in this thread my head hurts. I wish morons would read all the posts before commenting. I am pilot for Continental (United) and of course they will be used during takeoff and landing! These will replace the Jepps that we use, which contain all the approaches and airport diagrams, etc.